Call Centres have never been so busy. Just like any other business, if you run a call centre and want to get the most out of your employees, it’s important to give them the best working environment that you can. Whether you’re looking to open a brand new call centre, or your existing premises are looking tired and in need of refurbishment, Next Gen Interiors can help. As the number one contractor for Call Centres Fitouts in Melbourne, we’ve got the skills, the knowledge and the experience to create a workplace that will be the envy of all others in the business. Using high quality and up-to-date materials, together with our skills and expertise, we can fit out your call centre so that it’s not only aesthetically pleasing, but it will also be a comfortable and efficient place to work. We all know that productivity is the key to any business, and being comfortable and happy in the workplace is the key to productivity. Whether you’ve an enormous call centre to fit out, or you’re a small business just embarking on the whole contact centre ethos, we can build a custom-made solution for your call centre needs, a solution that will keep both your employees and your Finance Director happy. Our bespoke and speedy services have earned us the reputation as the best commercial office fitouts company Melbourne has available. Our loyal customer base comprises of a range of businesses who have used our services for a whole range of projects, from office fitouts right through to refits for industrial premises; many have used us on several occasions as they can rely on our products, our services and our commitment. One thing that does set us apart from the other commercial fitout companies, is the fact that we always do our utmost to make the whole process as easy as possible, from the initial contact and providing quotes for your call centre refit right through to providing a personal project manager to oversee your project from start to finish. In this way, you can always be sure that someone has their finger on the pulse when it comes to your fitout, and that there’s always someone to speak to if you have any questions about the process. Whether you simply want to renew your employees’ workstations with something more ergonomic, or you’d like a quote for a full refit of your call centre, get in touch with us today and let’s discuss your requirements. We’ll put together a free, no-obligation quote that will list each item separately, so you can see exactly the costs that are involved. Call us now on 03 9314 9088 or send an email to info@nxgi.com.au. 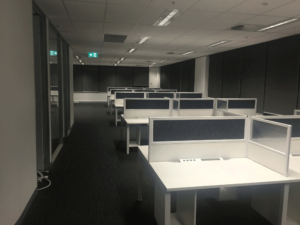 We’re looking forward to working with you to find a low-cost solution to fitting out your Melbourne Call Centre.